Artificial lake, Ma’ale Adumim- one of the biggest Jewish Settlements in the Westbank. By AgadaUrbanit. 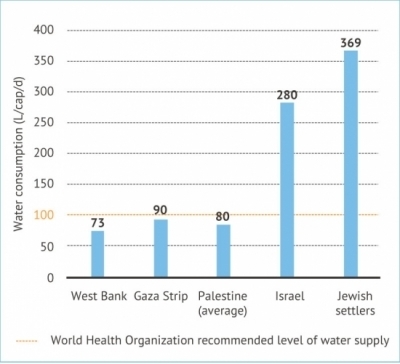 In 2014, the total Palestinian water use was about 310 MCM for a population of 4.55 million. 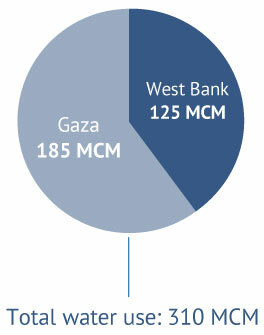 Of this, about 125 MCM was used in the West Bank and 185 MCM in Gaza. [i] During the period 2010-2015, around 55 MCM/yr of this total supply was purchased from Mekorot (Fig. 7). Figure 7. Annual water use in Palestine in million cubic metres. Source: PWA, 2014. It is estimated that around a third of the water supply is lost in leakages due to old and inefficient networks. The infrastructure cannot be readily replaced or modernized, however, because of restrictions on the movement of goods and people and other obstacles imposed by Israel. As described above, (Political Context), these obstacles include the requirement that permits be obtained for even small development projects from the Joint Water Committee (JWC) and Civil Administration (CA), and the huge financial investments necessary. 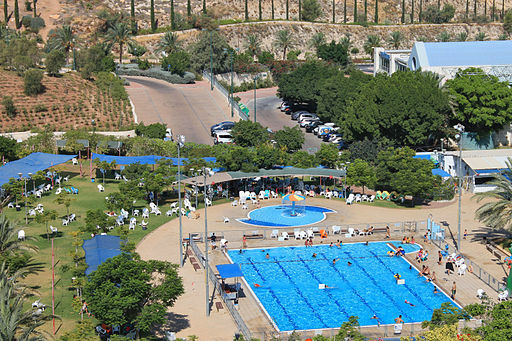 Water use in Jewish Settlements (Ma’ale adumim) in the West bank. By Davidmosberg. Figure 8. Water use in Israel and Palestine in litres per person per day (L/c/d). Source: Amnesty International, 2009. [i] PWA, 2014c. Final Water Sector Policy and Strategy, 2014. Available in Arabic at: http://www.wafainfo.ps/pdf/Water_Strategy_2014.PDF, accessed 5 May 2015. [ii] Amnesty International, 2009. Troubled Waters – Palestinians Denied Fair Access To Water. Available at: http://www.amnestyusa.org/pdf/mde150272009en.pdf, accessed 1 May 2015.